Are missing teeth affecting your self-confidence? If you don’t feel confident about your teeth, dental implants could be the answer. After all, a missing tooth won’t just affect your smile; I’ll affect the way you feel. On top of this, you’ll also be worried about oral hygiene and your ability to chew without discomfort, which means tooth implants may well make perfect sense. Dental Implants are one of the best and most effective ways of replacing lost teeth. By affixing a titanium screw to the bone at the site of the lost tooth, your dentist can place a permanent restoration into your mouth, which will not loosen or fall out with use. If you are missing one or more teeth and would like the ability to smile, speak, and eat again with the comfort and confidence, then dental implants are your answer. It’s important to replace missing teeth as soon as possible as gaps in the teeth can cause the rest of the dentition to move, very slowly, causing musculofascial changes and discomfort over time. Our expert implantologists can help you decide which implant will be best for you, but in the meantime you can find out more about our general implants, mini implants and ‘All on 4’ implants here on the website. 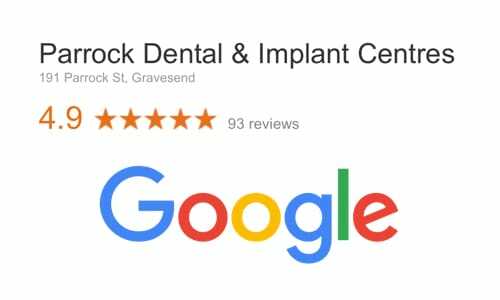 Our dental implants centres are based in Kent. Give you natural looking teeth. Keep your teeth in your mouth – not in a cup. Dr Rik Trivedi is the Principal dentist at Parrock Dental & Implant Centres. 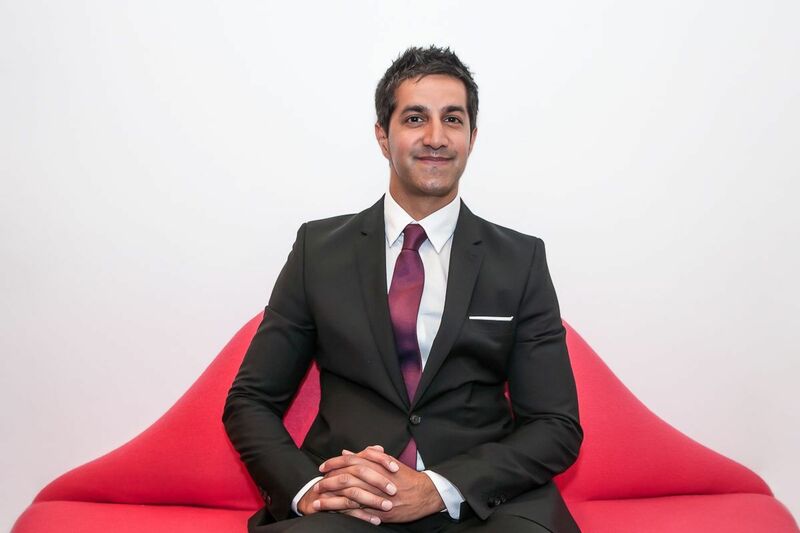 He has completed The Year course in Dental Implantology at The Harley Street centre for Implant and Reconstructive Dentistry and completed his advanced training at the Royal College of surgeons studying the Diploma in Implant Dentistry. He was awarded a distinction in his Masters in Dental Implantology at Uclan in 2015 and focuses most of his time in this field. We know that some people think implant treatment is expensive and search the internet for the cheapest option, but when you consider how implant surgery can change your life, would you really want it done by the cheapest bidder? A common question asked about Dental Implants is "How much does a dental implant cost?" While a basic implant is typically £1650 to £2500, this is a difficult question to answer as it depends on how many you need and your own circumstances. For a full implants price guide with options or you can receive a detailed, individual and fully-costed treatment plan by calling us on 01474 537191 or book a callback online now. ** Free CT scan if treatment booked during your initial consultation. Many people worry about the cost of implants, and so we have devised a number of payment plans to help you afford the right treatment. Teeth Implants cost £1.70 per day with our finance options. Want to know the cost of Dentures or false teeth? Learn the pros and cons for Dentures or false teeth and if they are cheaper than dental implants. Want to know the cost of Dental bridge ? 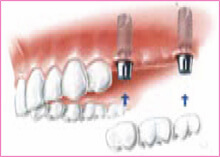 Learn the pros and cons for Dental bridge and if they are cheaper then dental implants. The All-on-4 treatment uses 4 implants to fully support a full set of permanent, natural looking teeth. Same Day Tooth is the answer to many patients’ problems when faced with a failing front tooth. The conventional solution: a bridge supported by teeth. This means that the healthy neighbouring teeth must be ground to support the bridge. Sometimes only a partial denture is possible in the side tooth region. An implant-borne crown is the best solution. The removable solution is a simple clip-fastened partial denture. Single tooth implants are the most elegant solution and for an alternative the implant borne bridge is just as good. Removable but still secure: bar-supported complete denture fixed to implants. 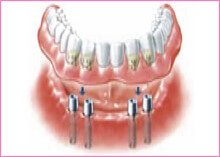 The permanently secure: bridge fixed to implants or the complete denture fixed to tapered crowns. 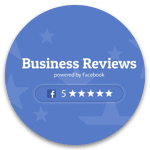 If you can’t find the answer to your question, call us. An dental implant is an artificial tooth consisting of a root and a natural looking replacement tooth. We use titanium for the root and porcelain to create the tooth. When would I need an dental implant? Implants are used to replace a missing tooth, or to replace a tooth that needs extraction. If a gap is left from a missing tooth, not only can it look unsightly but the teeth either side can tip into it over time, causing problems with the bite and, in some cases, gum disease. Whilst partial dentures can be used to replace missing teeth, implants are usually a much better option since dentures can hasten the loss of remaining natural teeth. Is fitting an implant comfortable? Are implants safe and how often will I need to replace my dental implants? 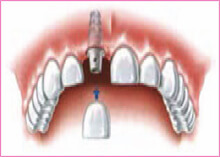 Dental implant are tried and tested, they have been used for a long time and are considered very safe. Nine out of ten modern implants will last for at least 15 years. Will I be able to remove my dental implants? Only a dentist can remove implanted teeth unless supported by bars or magnets. Can everyone have an dental implant? Your dentist will examine and take x-rays of the area to be treated, which will indicate whether implant treatment is the best option. Sometimes you may need a bone graft or a procedure called a sinus-lift if the implant needs additional support. How can dentures improve implants? Oral hygiene for implants is similar to caring for your natural teeth. An implant can last many years provided it is properly looked after. The dentist or hygienist will show you the most effective home care solutions. Whilst implantology is not the cheapest form of treatment, the improvement in quality of life it offers can be dramatic. Many patients report being more confident and eating more comfortably after they have had implants fitted. Can my implants be affected by gum disease? Yes, the gum surrounding the implant is the same as that around your original teeth, so gum disease could occur if your oral hygiene is lacking. You need to maintain good brushing, flossing and interndental cleaning.